Our schools were first established in the 1870’s and we’ve believed in wholistic education since the beginning. But we weren't the only ones, we were continuing a revolution started with the Protestant Reformation. The early reformers understood that to be effective they needed to develop an educated mind. The development of an active, curious, self-actualized individual is the fertile ground God intended for us. Under this belief these two reformers reorganized the schools in Eisleben and Madgeburg. These schools had several key elements. First, teachers did not burden the children with too many books and studies. They focused on how to think, what to think or the goal of covering every inch of a curriculum. Second, the theoretical was always be matched with the practice. “They should learn to do, by doing”; was the mantra. Third, independence of thought and individuality was honored and protected. Forth, competitive testing and pomp and circumstance was avoided. These schools thrived until the counter reformation. Not only was a counter system created, but it began to actively infiltrate and subvert the Reformation system. You can mark the decline of the Reformation to the popularity of the new Counter Reformation system in education. Later in the United States Thomas Jefferson tried to create an education system based on the Reformation style. It worked for a time until it began to follow the European style. God tried again to raise a movement when the early Adventists began their education system. But eventually that revolution faltered in the late 1800’s. Enamored with pomp and circumstance and the trappings of the prestiges European and American secularized colleges, our institutions began to change. It was at this time Ellen White, freshly back from Australia, boarded a boat with her son and several like minded revolutionaries, Sutherland, Magan and others. Their goal explore the opportunities to restart the educational revolution in the South. Many of our current schools can trace their origins and founders back to this little boat. For decades now we have studied our decline. We have become convinced of the crisis and apparently the inevitable shrinking of our system; but crisis is actually an opportunity! Here’s why, human nature will not easily allow for change and revolution without crisis. Our schools grew in the beginning not out of loyalty to the denomination, but instead out of a shared purpose and action. We were a movement instead of an institution; we were purposeful. Called to make our communities better though meeting their practical needs of health and education. Then once proven trustworthy, sharing the gospel. As we have grown into an "old" organization that purpose has been obscured by tradition. We stopped asking ourselves "Why" and settled for "Because". For many years that answer was enough to keep us afloat, but as those generations went though our schools they found, that answer, to be dry and empty. We've tried to sell Adventist Education for its ability to make Adventists, and to raise test scores, but these are not the most compelling reasons for Adventist Education, they are by-products of a deeper answer. The answer to why Adventist Education is valuable is that it creates men and women who know Jesus. Men and women of action; skilled in the practical application of the knowledge they acquired. Who are driven to create opportunities for themselves and their communities. We make the world around us better! We fulfill our Creators intention. The light on the hill that draws the world to Him is not a static activity of waiting, but an active search, reaching out into the darkness. In studying the original blueprint it has become clear that our schools were never meant to stay insular in nature. They were to be the embodiment of the great commission. Just as the medical training at our colleges and hospitals was meant to reach out into the community and offer better living. Adventist Education was meant to do the same, reaching out with the message of wholistic education. Done correctly the two arms of ministry make the surrounding community healthier, better educated and aquatinted with the Savior. Freeing minds and bodies to hear and understand the gospel. The left and right arms of our denominational work reach into the world drawing them to the body of Christ’s church. Of all the issues facing the Adventist church this is one of the hardest to change; but it is essential if we are to become what we were created to be. If we want to see our teachers using a new pedagogue we must change the methods we are modeling. The model must be changed at every level, our schools are are the location of our future. We need a new pedagogue, the pedagogue of the self reliant student. The new model must value practical application, hands on learning, reflection, active assessment based on more than grade percentages, it must find room for creating and making, project based and service oriented learning, adaptability toward the varying levels of the students regardless of grade level. Our education should inspire the innate creative spirit. How much has educational corpulence increased since 1919? In order to free ourselves to teach and honor the necessary physical activity of a well rounded student we must be diligent in trimming "the fat." Every school should carve out time each day for both structured play and free play in the elementary and practical application in our high schools and colleges. This can be scary, academic time is precious. But this time of activity will make academic time more productive, allow the coverage of as much or more than would be covered if you didn't have the activity. We also need to focus on understanding, instead of time-lines. Let's worry less about "getting to the end of the book" and more concern with how much our student truly understand. Asking what did you learn instead of what grade did you make. Let us teach student how to think, not what to think. Every year, time should be spent reevaluating what is necessary and what is redundant. How can we combine subjects; accentuating their natural connections not only to be more efficient, but more effective in creating understanding in our students minds. The easiest route to change how we teach is by equipping the teachers going into the schoolroom. Our teacher training should focus more on real classroom experience with teachers who exemplify the best. We must invest in veteran teachers who are already using this "new pedagogue" supporting them and encouraging them to continue and grow the ranks. We need empower them as evangelists for the new pedagogue, so that they can ignite change in the staffs they join. We were meant to be the dreamers, the troublemakers, the non-conformists, the free thinkers and the difference makers. It’s time to do something! The Revolution starts with you and it starts now! Let us relight the fires, let’s act more like revolutionaries. Adventist Education was created alongside the medical work to be a preparation for young people to develop skills that would make them an invaluable part of any community. Through their intelligence, diligence, kindness and skillful service graduates from our schools would become beacons of blessing no matter where they found themselves. Their abilities would be hallmarks of excellence and would naturally lead them to positions of leadership and respect in their communities. TeachSDA is continuing to advocate that administrators, teachers and students keep this goal in mind. Our academic goals are not secondary to a solid relationship with Jesus. They are an integral part of the holistic ideal of Adventist Education as missionary training. We believe that every individual is a missionary called to minister in any area God places them in. Through studies like Value Genesis it is clear that our religious emphasis has positive results, students who attend our schools are more likely to be active members for the rest of their lives. Through our research in the academic programs of Adventist Education it is also clear that the longer students attend our schools the better they perform. Often with standardized tests, SAT and ACT scores far above their counter parts in both parochial and public schools. This issue will cover several topics that every excellent educator should be considering! The 2017-18 school year has begun for me here in the Southern Union and many of you have started as well. 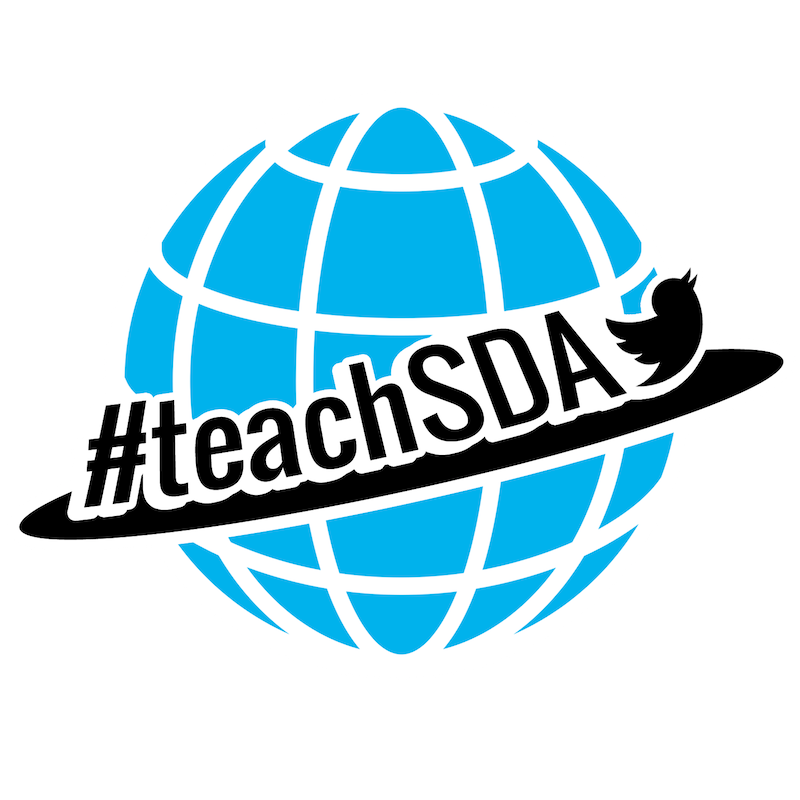 Some of you have been a part of the teachSDA community for many years and some of you are new. I thought it would helpful to remember why we started teachSDA. Chris Webb was a former student of mine and during his academy and college years he developed a love for education. I was overjoyed and encouraged him at every opportunity. He eventually graduated and began teaching in Taiwan. He was an amazing teacher, I like to think I had a bit to do with that. But he quickly realized what many of us veteran teachers learn early. The classroom can be painfully isolating. Educators become so busy with the day to day management that they lose perspective and connection with those around them. The system also tends to isolate and silo teachers giving them very little opportunity to expand their professional network. Add being on the other side of the world and the issues are magnified. So what could be done to solve the problems? Chris and I continued to talk through emails, Twitter, Facebook and video chats and eventually came to the conclusion that technology could be a helpful tool to connect teachers from diverse backgrounds and locations. So many of the day to day issues we deal with as teachers are universal. So we could benefit from the creativity and wisdom of others. The platform could also be used to advocate thoughtful and deliberate educational ideas in Adventist Education. So the first Adventist Twitter personal learning network was created. Over the course of that first year a website and newsletter was added; eventually a Facebook was added too.